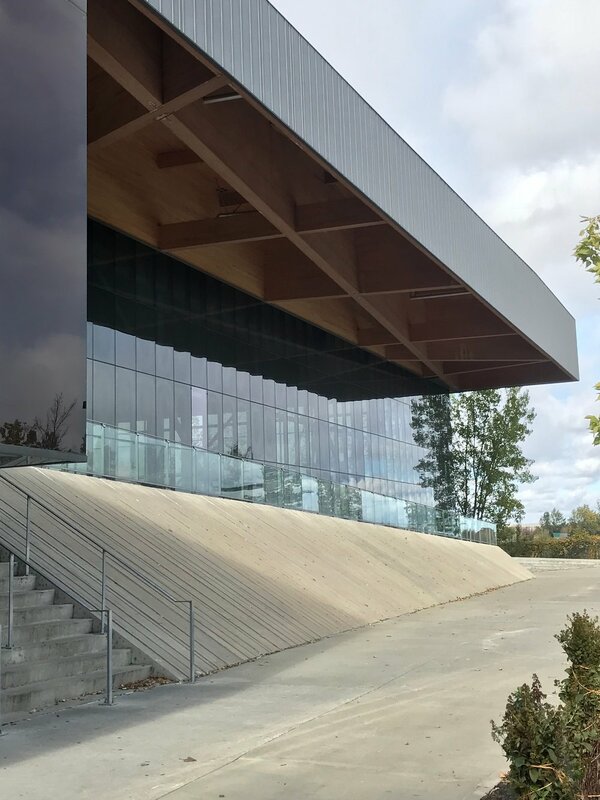 Located in Montreal, Canada, this project sought to exploit mass timber’s qualities for formal and organizational innovation. Our goal was to understand and answer questions on How can timber inform a building’s identity, and clearly organize a building’s program?. Our decision to build three separate buildings originated from the desire to separate the guest experience in the hotel from the public going to the market. Our aim was to be able to expose both publics to both programs while at the same time maintaining the integrity of the three building designs. 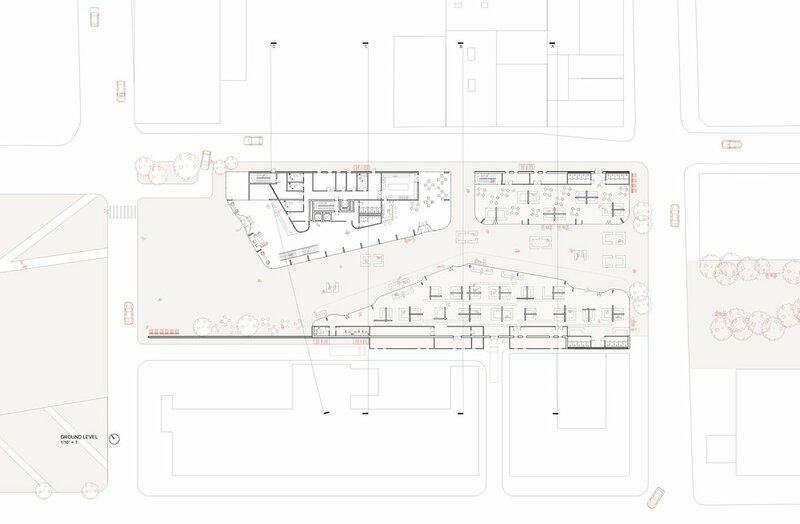 Urbanistically, the three buildings create a public path running through the internal part of the site that connects the public parks surrounding the site. The three buildings are split based on their programs, the tower, is located in the northern part of the site. The market building is split in two, one serving a food hall public, located adjacent to the hotel tower and the other market building is designed for daily revenue with produce and is located on the opposite side of the site. 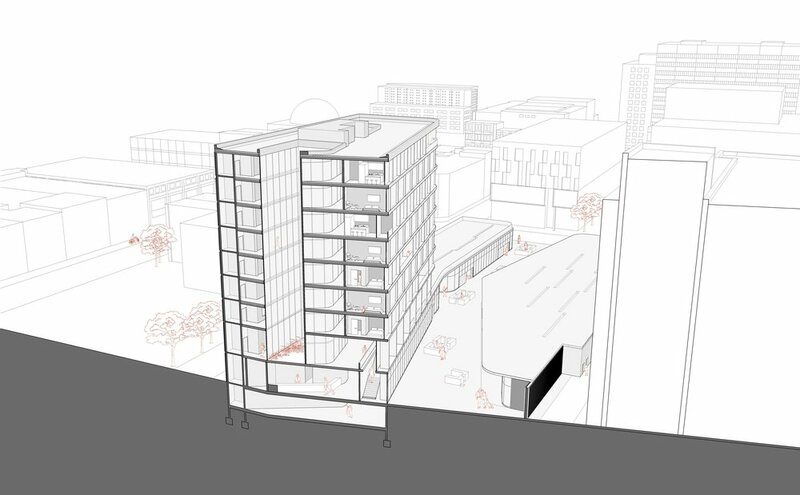 The ground floor, shown on this drawing is the most public part of all building and serves to unify all design programs. The tower ground floor consists of the most public program requirements, the lobby, restaurant and bar which is accessible to the general public, not just guests. The facade of the tower is mainly made out of floor to ceiling glass panels in order to maximize the amount of natural light into the mostly solid wall building. The glass facade in the tower and the market play with the floor plate and entrances, sometimes moving back to bring people into the market for example and receding for some of the guest rooms so that these can be read as separate units on the facade. 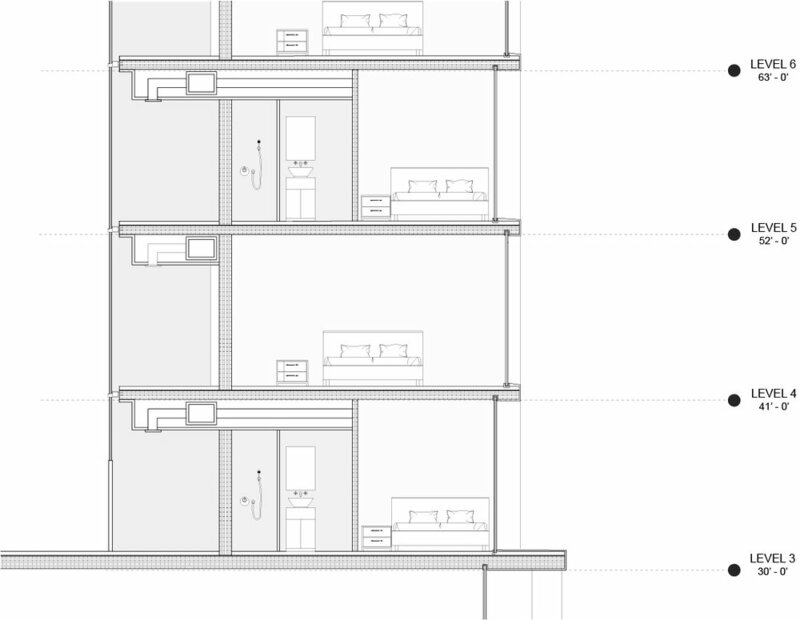 The CLT room partition walls allowed for no light to seep into the circulation area of the upper floors. As a solution we opened the center part of the building to make room for a glass atrium that went from the second floor of the building all the way to the roof. This also created some outdoor area on the 2nd floor of the tower for guests.